Assumption Parish is located in south Louisiana, just west of the Misssissippi River and the industrial corridor that stretches along the river between Baton Rouge and New Orleans. 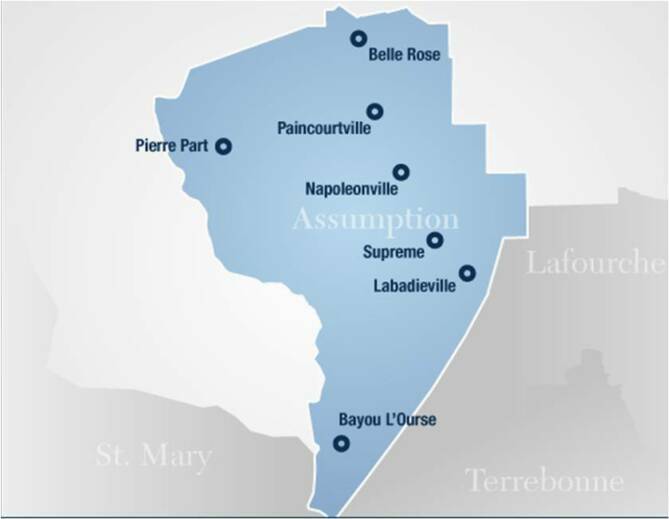 Assumption Parish is therefore conveniently situated near the industrial activity of the Mississippi Region and the Gulf of Mexico coastal area. Much of Assumption Parish is laced with bayous. The highest land in the parish is located along the banks of Bayou Lafourche where the elevations range from 15 to 20 feet above sea level, forming a natural levee. Bayou Lafourche is 107 miles long and is presently navigable from Thibodaux to Belle Pass at the Gulf of Mexico. Lake Verret, Grassy and Lake Palourde form the western boundary of the parish.